The other evening we attended a get together with some friends from church. We ate pizza and enjoyed one another’s company. I think I can speak for everyone by saying that a good time was had by all. For entertainment, we watched the movie God’s Not Dead, which had come out on DVD not too long ago. As is my custom, I looked up the movie on Wikipedia, etc when I got home. I was not too surprised to learn that the critics generally hated God’s Not Dead, panning it for having one dimensional caricatures as characters and ham handed messaging. I was also not too surprised to learn that it was a box office success. The fact that a film that appeals to the faith and sentiments of a large section of the American people has been described as a “surprise hit” says a lot about the disconnect between the values of the entertainment industry and the people they expect to buy their products. I doubt if any other industry that was so clueless about their potential customers would long survive. There is not much to be said about the plot of God’s Not Dead that isn’t already generally known through the publicity the film has generated. A professor of philosophy, Jeffrey Radisson, played by Kevin Sorbo, demands that the students in his class write out “God is Dead” in order to receive a passing grade in his class. Every student writes the statement and signs their name except for Josh Wheaton who finds that he cannot act against his faith. Professor Radisson then demands that Josh prove the existence of God in three debates that are to take place at the end of the next three classes. The premiss may seem rather outlandish, then again maybe not. The environment on many universities does seem to be increasingly hostile to religion, particularly Christianity. The influence that causes many young Christians to lose their faith on campus may be far more subtle than depicted in God’s Not Dead, but it is there. 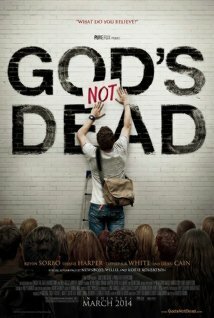 On the whole, I think that the criticisms leveled at God’s Not Dead are just ones. The message of Christians being required to defend their faith is not very subtle. Professor Radisson and the other atheists in the movie are caricatures of the stereotypical angry, obnoxious atheists. However, in defense of God’s Not Dead, I have to say that its failings are not, in fact, worse than much that comes out of Hollywood. If atheists are offended by the shallow depictions of their beliefs found in God’s Not Dead, then now they know how many Christians and conservatives feel as we sit in a theater. I also have to say that many atheists really do come across as the sort of obnoxious arrogant jerks that Kevin Sorbo plays. For the person whose exposure to atheism consists only of the writings of Richard Dawkins and the antics of internet trolls, not to mention the Freedom from Religion Foundation who seem to be deliberately trying to make atheists pariahs, Sorbo’s depiction rings true. I have also seen movies with some environmentalist or generally left-wing message presented with far less skill than God’s Not Dead. I don’t think that the arguments presented by either Josh or Professor Radisson were very good ones. There was not enough screen time devoted to the actual debate to really develop the arguments. This is part of the reason why although I generally liked God’s Not Dead, I did feel a certain frustration while watching it. This movie was not as good as it could have been. The premise is interesting. Kevin Sorbo and the other actors were good. The production values were as high as could be expected, yet it was all somehow not quite enough. This could have been a thought-provoking movie, but it didn’t quite reach the mark. I think that most of the extraneous subplots ought to have been cut out to make a leaner, more straightforward narrative. The movie also could have done without the cameos by Willie Robertson and the Newsboys. These subplots and cameos only served as distractions. Professor Radisson ought to have been depicted in more sympathetic fashion, rather than as almost a cartoon villain. Perhaps they ought to have had him challenge Josh after a class discussion. This might have made for a more interesting movie. God’s Not Dead is a movie worth watching but it could have been so much better. Kevin Sorbo on atheists: ‘How do you get so angry at something you don’t believe in?’ (christiantoday.com) I have often wondered that myself. Review/Rant: God’s Not Dead – The Most Offensive Movie I’ve Ever Seen (obsessiveviewer.com)I can think of a whole lot worse. Kevin Sorbo, I am here to answer your ridiculous questions about atheists (deathandtaxesmag.com) And manages to prove the point. This entry was posted on August 31, 2014 at 4:36 pm and is filed under Christianity, Movies, Television and Entertainment, My Life. You can follow any responses to this entry through the RSS 2.0 feed. You can leave a response, or trackback from your own site.